Google Chrome: the engine room of the modern online marketing operative! But if you’re more into the social media platforms you frequent than the browser on which you do so, you might be wasting a lot of unnecessary energy. Because the Google Chrome you get out of the box represents only a fraction of what you can do. One of the great things about the internet – so long as it remains relatively free and independent, of course – is that everybody is free to tinker and improve on what they find. So great armies of third-party extension developers are hard at work creating add-ons for your browser, either as a way to make a buck or just because they care. Seriously: some people just see something that needs fixing, and fix it because it’s there! In the case of Google Chrome, this means identifying stuff you should be able to do with the world’s most popular web browser, and making it possible. Things like keeping notes, organizing your emails, and collaborating remotely. So let’s take a look at some of the extensions that have been developed to do just that. We’ll begin with some of the more random stuff. For example, LastPass, which securely holds onto all your important passwords to prevent you needing to keep them written down in a notebook (which anyone can see) or with Chrome’s own password-saving mechanism (not very secure). Talking of online problems, here’s a biggie for online marketers: ever lose all the text you’ve just entered into a dialogue box because of a power- or Wi-Fi-outage? It’s pretty annoying by itself, even before you take into account the financial blow: businesses lose around 3 days productivity per year, on average, as a result of connectivity fails. Typio is a solution for all that. It saves your text as you type, without transferring it across the net, so that it’s both safe and secure. Most of the extensions mentioned in this article will help make your productivity more efficient directly or indirectly. Here’s a couple that are particularly geared towards helping you to work faster and better. Win The Day is an overall productivity manager – or perhaps it’s better to call it a productivity motivator. In the first place, you can use it to set goals and stay on track as you work towards them. This is particularly useful when you consider that aiming towards specific, difficult goals can get you working up to 250% faster! But this add-on doesn’t just remind you of your goals. It helps you to stay on track towards them by hiding distractions and feeding back to you on your habits and workflow. That way you can continuously tailor your approach to stay as efficient as possible. Webtime Tracker is a more simple alternative that puts the emphasis back on your own sense of responsibility. It keeps an eye on exactly where you’re spending your time online and what you’re doing, so that you can identify for yourself just where your productivity leaks are occurring. Or to go even more ‘authoritarian,’ consider adding Stay Focusd to your Chrome browser. This one locks you out of your most notorious time-wasting websites after you spend a certain amount of time on them each day. Because you can’t be trusted, right? Let’s just suppose you’re actually pretty disciplined when it comes to working online. Well, there are still other traps out their waiting to sabotage your productivity. Inbox When Ready can help you avoid this issue, hiding your inbox by default and allowing access to it only at pre-determined times so that you can ‘batch process’ your inbox. Or if your emails are potentially too important to lock yourself out altogether, try Google’s Snooze Email function. This one lets you see emails as they come in, but if it’s not urgent you can just click ‘snooze’ to have the message resent to you at a more appropriate time. Some extensions have more specific workplace solutions in mind. For example, you’ve probably heard of Grammarly, the app that keeps your spelling and grammar looking hot. In fact, your boss has probably nagged you to use it. But if you’ve been using the online version or desktop app, you could be wasting precious time. It’s actually possible to add Grammarly to your browser itself, so you can check the quality of your prose as you go. Because social media is an unforgiving place, and you can be sure every marketing typo you make will come back to haunt you. And how about when you’re researching those award-winning posts you like to make? The internet is the home of contemporary research, but it’s a bit of a swamp once you wade into it. Online research tools such as Evernote or Google’s own Keep facility can help you keep your research in order, either by clipping text and images to a virtual scrapbook, or allowing you the easy option to write or voice-record your own notes as you go. 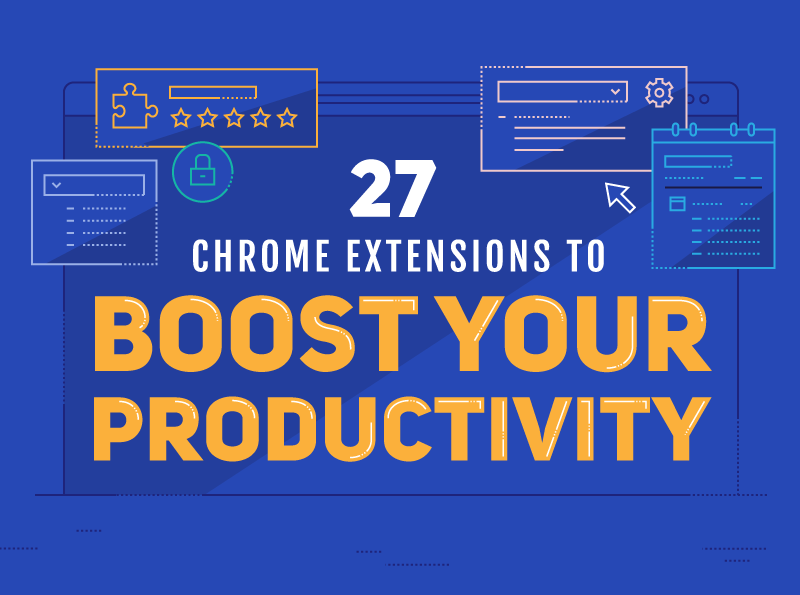 If these productivity solutions are already blowing your mind, work your way through this edited list of top efficiency extensions for Google Chrome. It’s time to get your browser working for you.